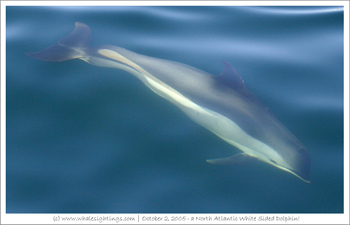 A species that can hardly be missed when it visits (usually from August on) as the dolphins travel in large pods. It is then easy to spot the white band on the side from which the name comes from. While we often think dolphins are a feature solely of tropical waters, these dolphins prefer waters colder than 12 degrees celcius. Seen usually after mid-July, beginning of August, until the end of October. Often in large pods of hundreds of individuals.